I hear and read all the time that iceberg lettuce has no nutritional value or that it is simply crunchy water. I beg to differ. 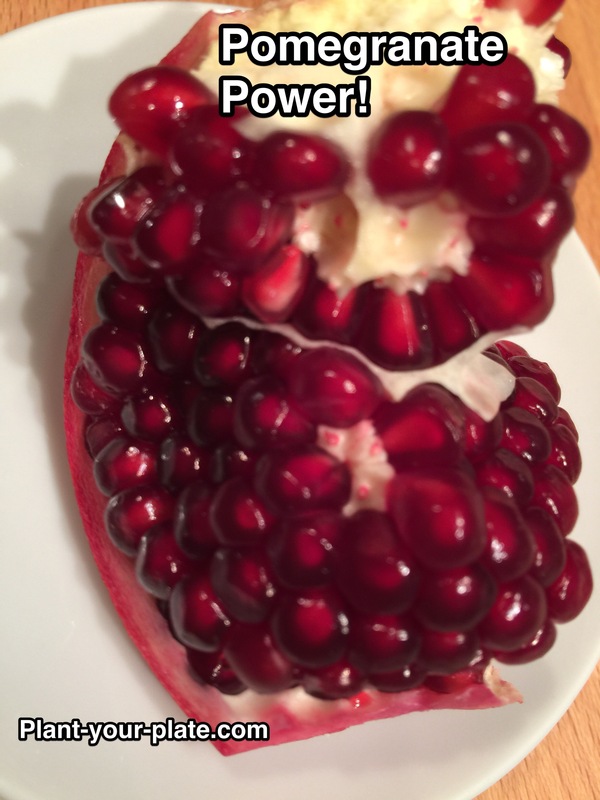 One large head of ice berg lettuce provides a very respectable 9 grams of fiber and …. 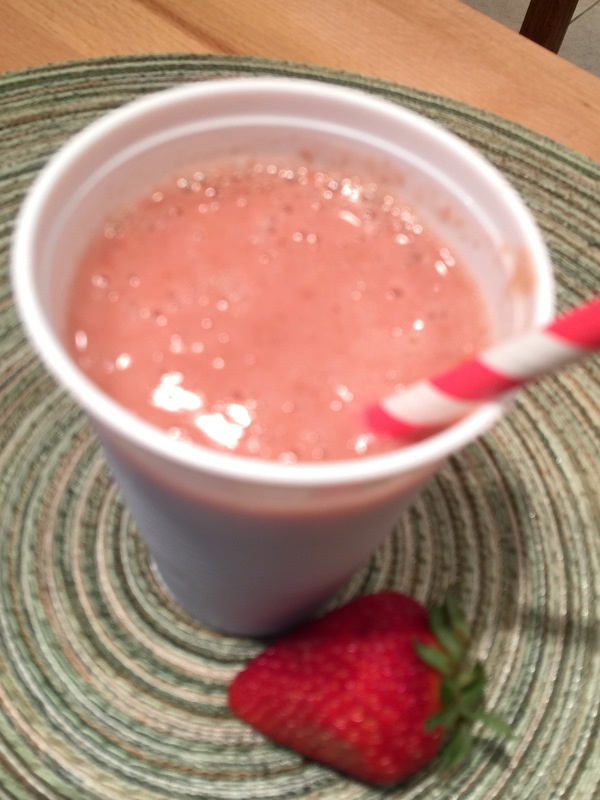 wait for it….7 grams of protein! It also provides 76% of a day’s requirement for Vitamin A , 35% of a day’s requirement for Vitamin C, 14% of a day’s requirement for Calcium and 17% of a day’s requirement for Iron. It is also a good source for thiamin, Vitamin B6, potassium, folate, and manganese and is low in sodium and has NO saturated fat, trans fats, or cholesterol. In a nutritional target map, it ranks at the top of the “more filling” range and at the top of the “more nutritious” range. If you were to get all of your day’s calories from iceberg lettuce alone (even if we use a very conservative total of 1200 calories) you would get 84 g of protein and meet or exceed the recommended daily intake for nearly every other nutrient. 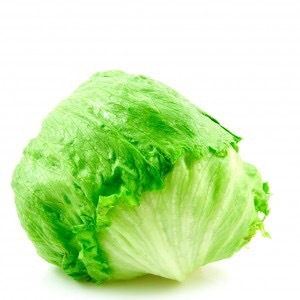 Okay, Okay, you would need to eat 12 large heads of lettuce to do that but hey Iceberg lettuce is no nutritional lightweight – Help me clear its reputation while you enjoy the crunch! This coming Sunday is Super Bowl Sunday, a day anticipated by many (and some of them are actual football fans). I enjoy a good commercial break myself while some are looking most forward to the buffet of Super Bowl snacks. One of the classic Super Bowl snacks -wings (hot wings, Buffalo chicken wings) has grown particularly popular. Did you know that if we lined up the wings eaten each Super Bowl Sunday wing tip to wing tip they would circle the earth more than twice or reach a quarter of the way to the moon? 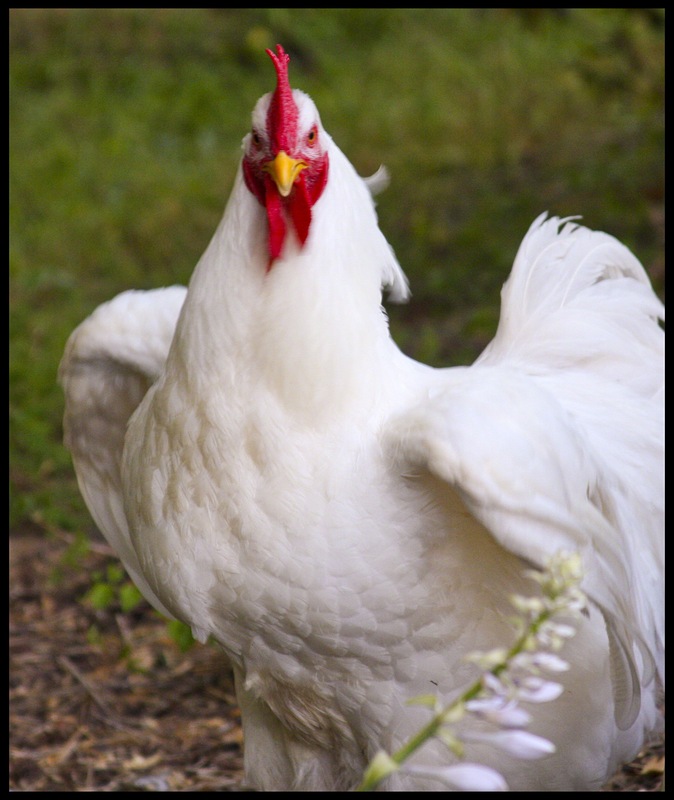 Did you know that it takes 600 million chickens to produce that many wings? That is two chickens for every American man, woman, and child! 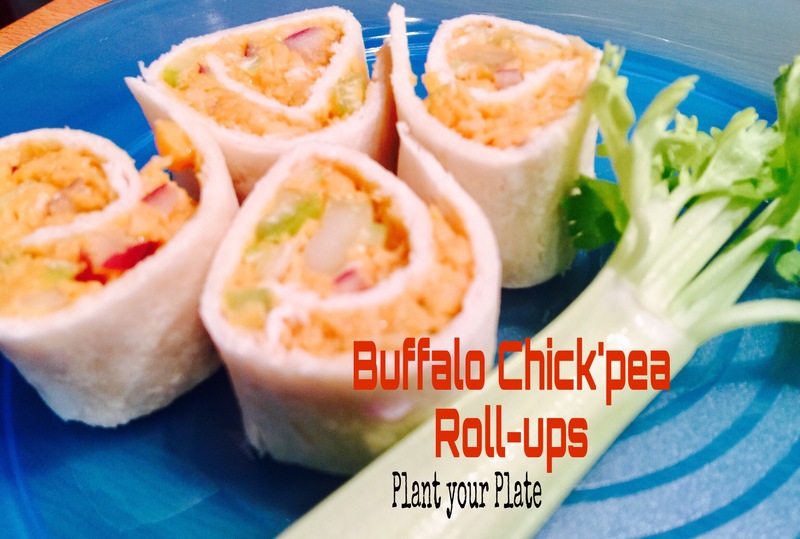 My super Bowl gift to you, my recipe for Buffalo Chick’pea Roll-ups – no chickens lost their lives in the making of this snack. Just 5 ingredients (well 6 if you count the tortillas) and a little more than 5 minutes. That’s all it takes to make my favorite new roll-up! The quality of their diet was measured using the AHEI score (Alternate Healthy Eating Index) where eating vegetables and fruit and cereal fiber increase the score and where including red meat, saturated and trans fats and alcohol decrease the score. The results are in – a decrease in diet quality of more than 10% over 4 years was linked to a 34% increased risk of developing type 2 Diabetes. However, when diet quality increased by over 10% over 4 years, the risk of type 2 Diabetes was reduced by 16%. 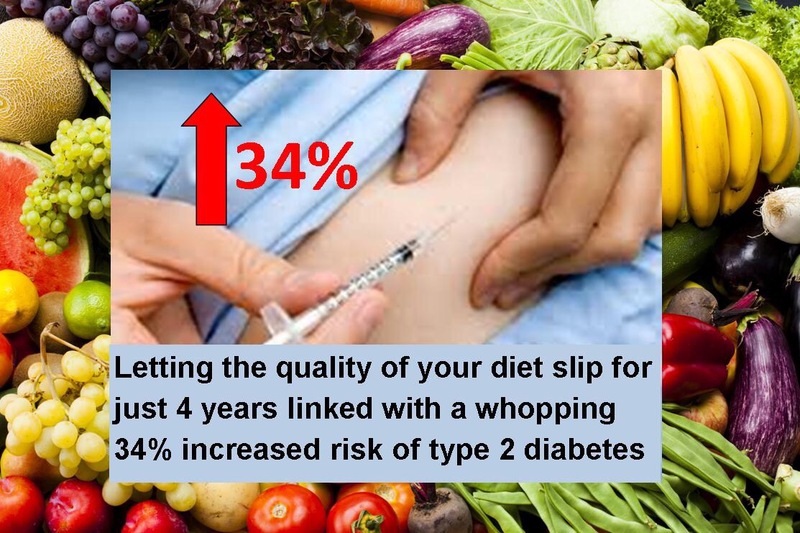 That is a 50% difference in diabetes risk between those who made moderate improvements (10%) in their diet quality and those who let the quality of their diet slip by 10%. Now you might be thinking that those whose diet quality decreased, gained weight and that explains their increased risk of diabetes. Not that simple. BMI (body mass index) explained less than a third of the new cases of Diabetes; showing once again that people can develop type 2 diabetes even at lower BMI level when they consume a poor quality diet. Moral of the story – Even small changes can make a difference! 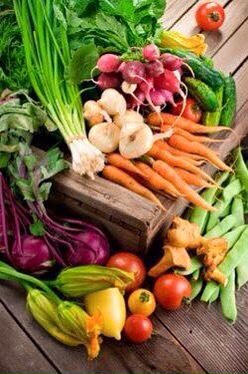 Plant your plate now for a healthier tomorrow! Since I’ve been lucky enough to babysit some of my favorite kids this week I’ve been thinking more about kid meals and how to keep them happy meals. At the same time I like to think that perhaps I could have a small healthy influence too. Lots to think about and balance and rethink and re-balance. I remember when my kids were the ages of their kids when I instituted the “two food rule”. Everyone was allowed to not like two foods but only two foods. There was a chart where each person’s choice of their two foods were posted. 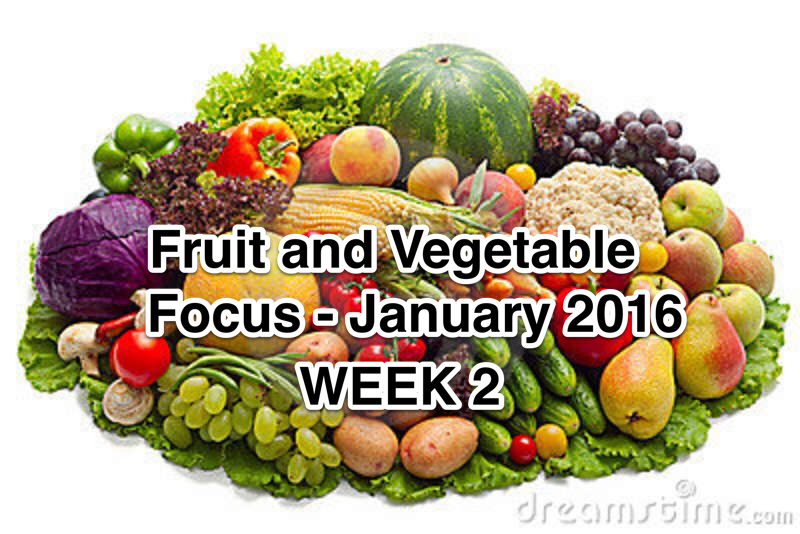 The foods of choice could be changed at any time but had to be done in writing. Complaints in general also had to be submitted on a written form. Worked well and made meals pleasant and some people learned to like some surprising foods along the way. 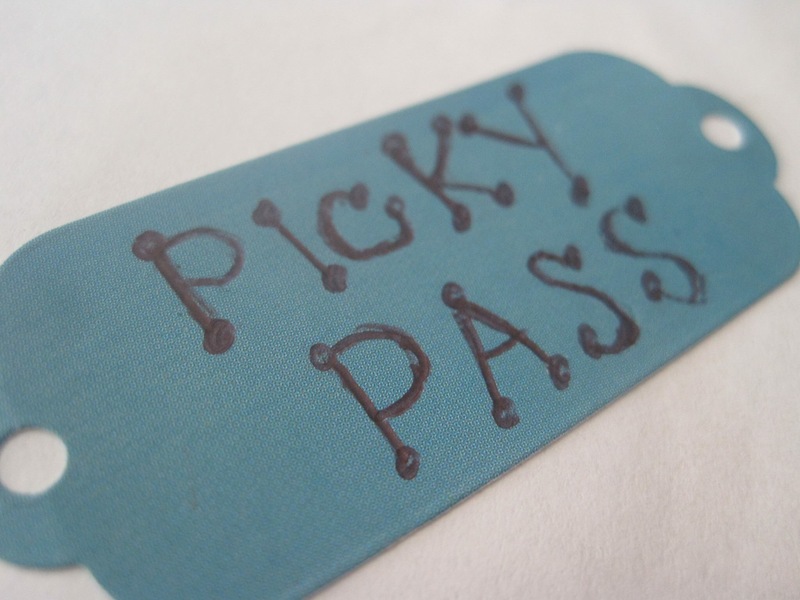 What do you think of the two food rule and of the picky pass? What are your favorite tricks? 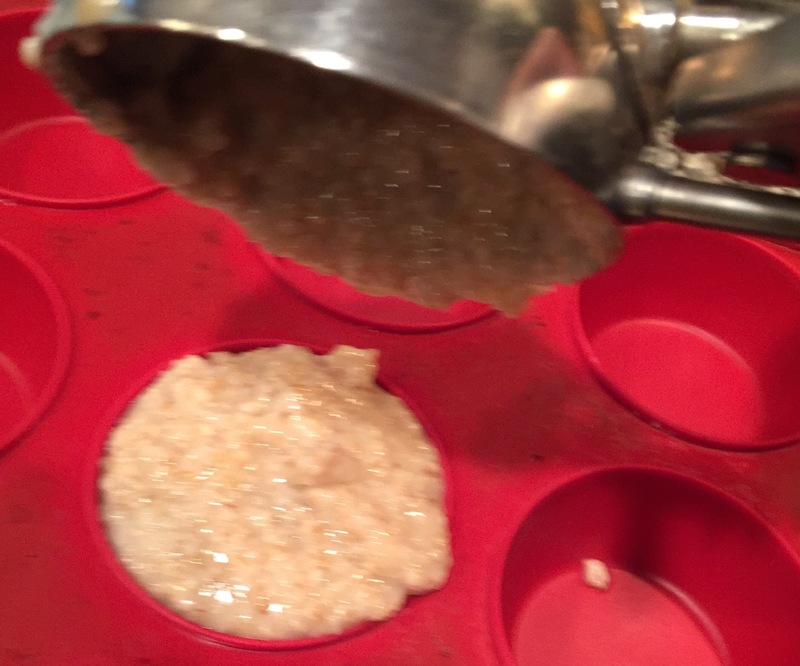 Rinse quinoa with cold water in a mesh strainer until water runs clear. (This removes the bitter coating.) In a medium saucepan, bring 1 1/4 c water to a boil. Add quinoa and bring mixture back to a boil. Cover, reduce heat to low and let it simmer for 12-15 min till quinoa has absorbed all the water. Remove from heat and fluff with a fork. Make the dressing. Put peanut butter is microwavable bowl and heat in microwave for 30 seconds. Add in ginger, soy sauce, vinegar, maple syrup, fish sauce, lime juice and Thai chili paste. 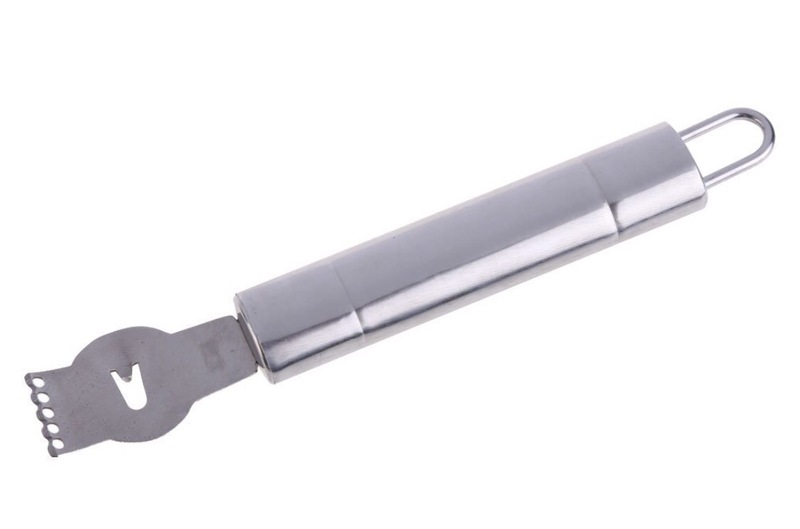 Stir till smooth. Add dressing to quinoa. 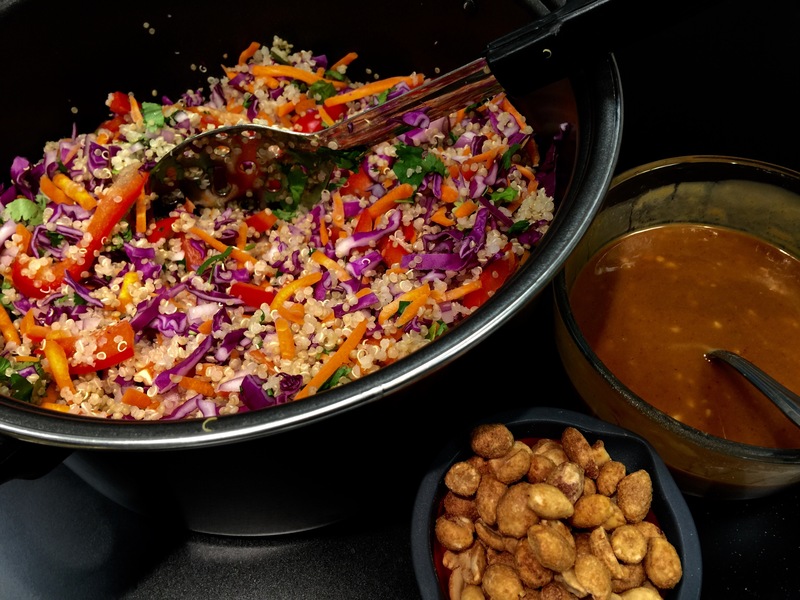 Fold in cabbage, red pepper, carrots, onion, peanuts and cilantro. ‘It was a cold and windy night’ is the way the story usually starts but actually it was a cold and windy and busy night and I learned you can make really great soup without a recipe. I love to try new recipes. I do it for fun…when I have time. But I need to eat more often than that. 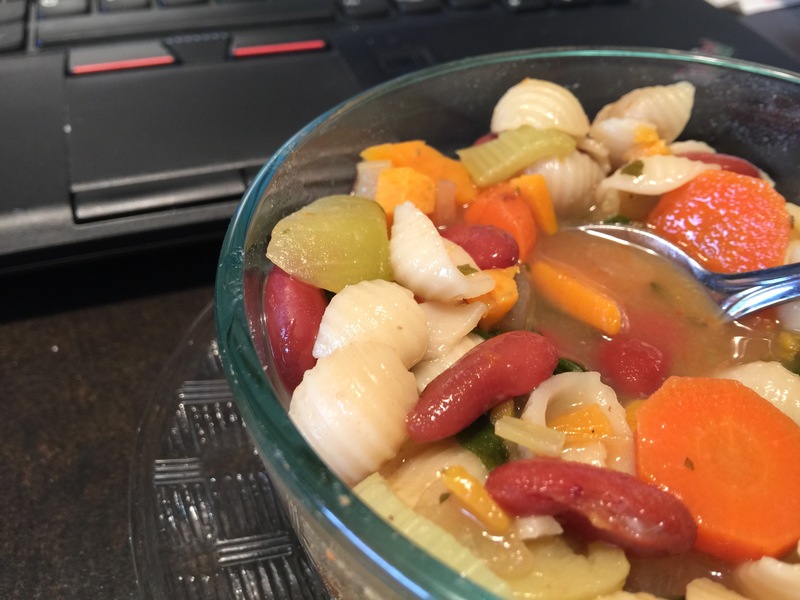 I had saved several Minestrone soup recipes onto my “Gonna make that someday” Pinterest page but no time to go there. So…I just started to combine what I had, throwing into the pot as I sliced and diced, opened a few cans, and discovered treasures in the back of the produce drawers. And…if I do say so myself it was Deeeeeeelicious! I thought about trying to capture the recipe after the fact but decided to try to capture the concept instead. I have tried it on several other occasions, varying the mix, and loved the simple and GOOD results every time! 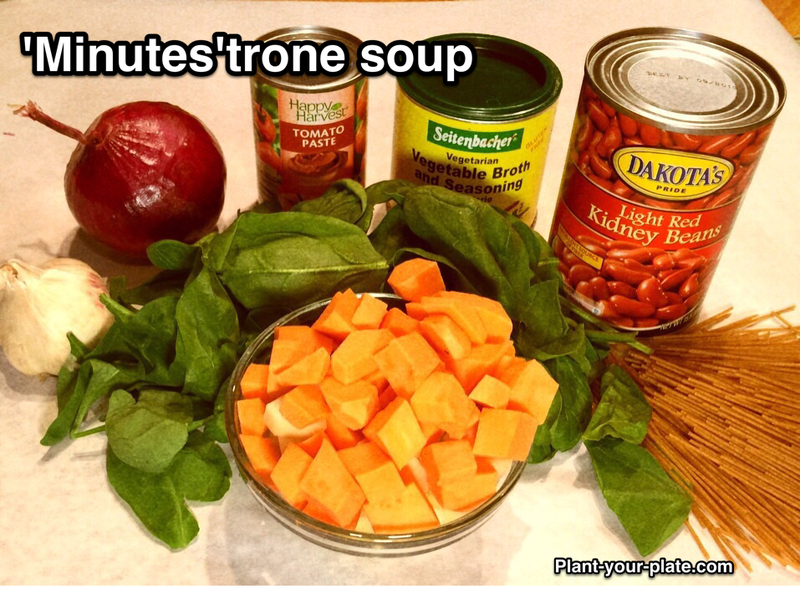 So here you have – (insert drumroll) -my UNRECIPE for ‘Minutes’strone Soup. 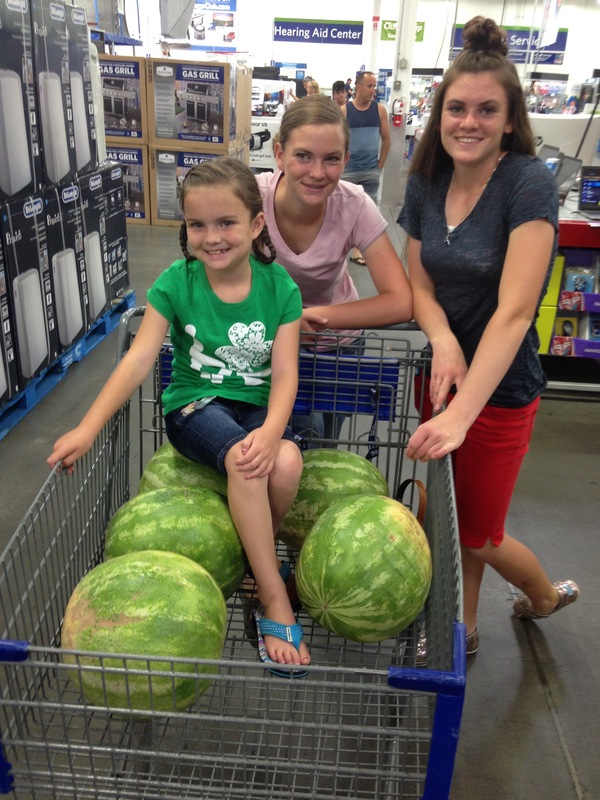 No running to the store allowed; use what you have. 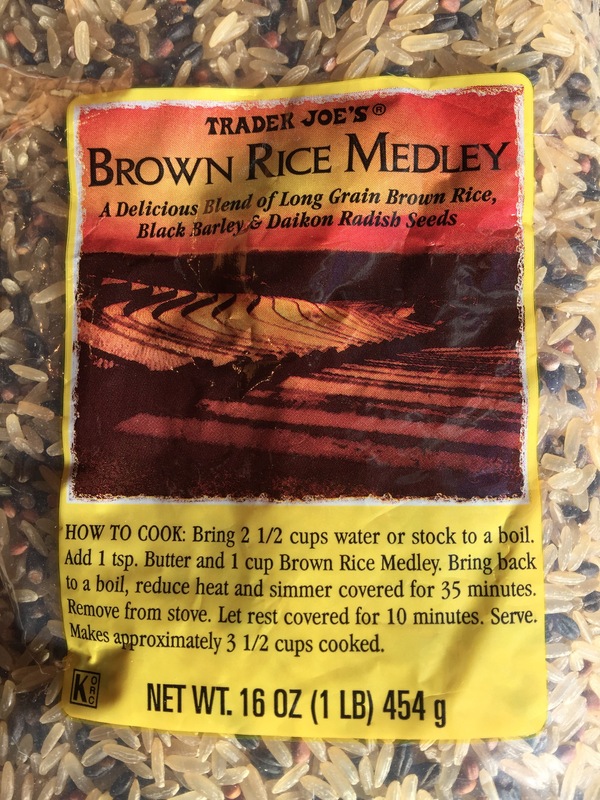 The below formula made a small batch (2 dinner servings and 2 generous lunch servings). Increase amounts to fit your crowd. 2. Add something red or orange, about 1/2 cup of something like tomato paste or sauce, canned tomatoes or pumpkin, or those grape tomatoes that are starting to wrinkle a bit, it even some salsa. Add a little more or less as taste or supply dictates. 4. Make it ‘stick to your ribs’ by throwing in some potato, sweet potato, cooked grains (like rice, quinoa, barley, etc.). 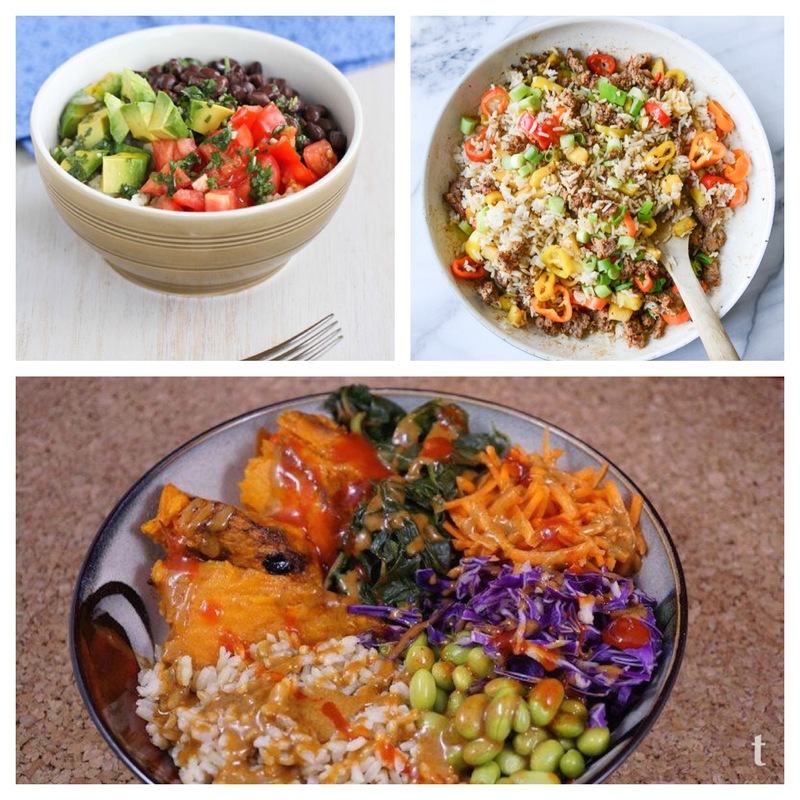 I use about 1-2 potatoes or sweet potatoes or combo or 1 c cooked grains. 7. Add then to make it more ‘Olive Garden’ like, add a handful of small pasta, like little shells or bow ties or even broken whole wheat spaghetti. Up to this point just add ingredients in the order listed and let things cook as you work. Once you add the pasta, you will want to set timer for the shortest time listed on the package. 8. For a last minute touch, toss in about two hands full of baby spinach or kale and possibly a few fresh herbs when there is 2 minutes left on the timer. And when that timer goes off….tada ….. ‘Minutes’trone is ready. 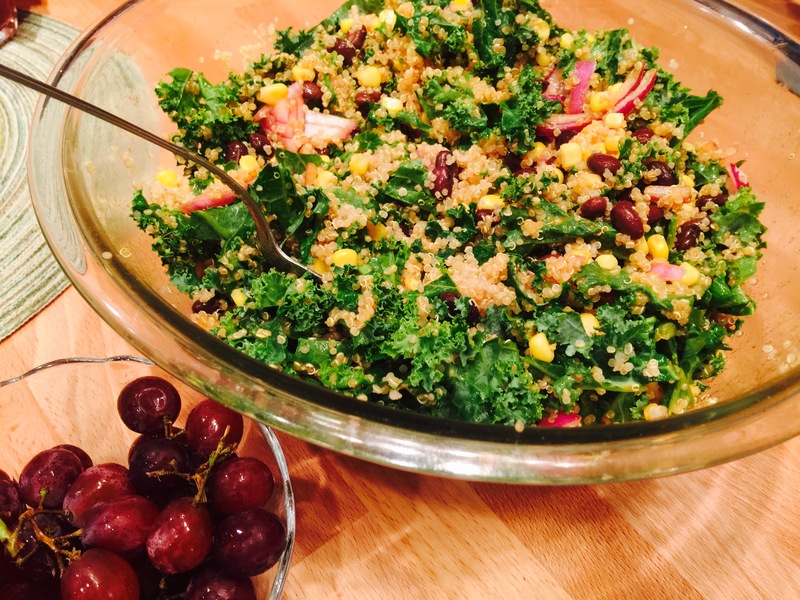 Serve with a fresh salad and some crusty whole grain bread. Enjoy! I usually prefer to buy my carrots whole with the skin still on. They cost less per pound and seem to taste better even if they require peeling, slicing and dicing. But when baby carrots were $.49/lb. recently I bought a couple bags. Seeing the last bag in the crisper drawer with its freshness clock ticking, I decided to try something…and Beanie Ca’Weenies were born. 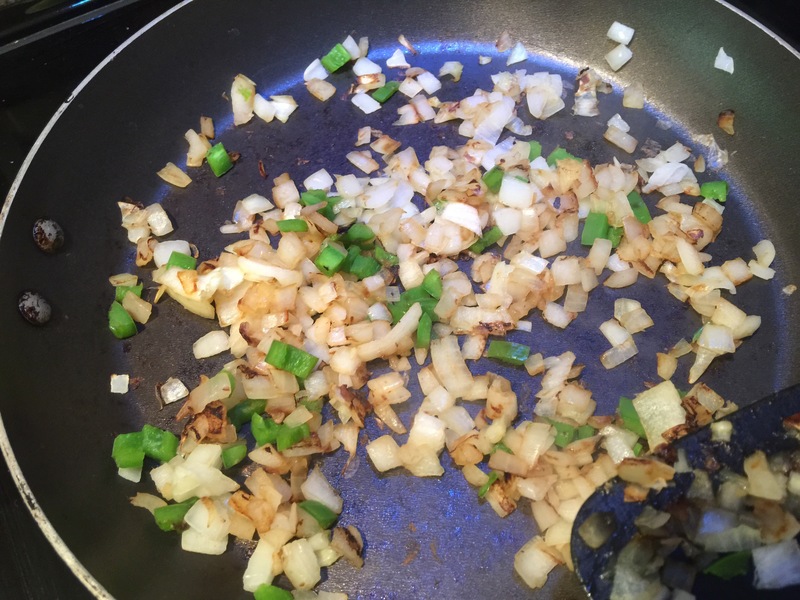 The onion and jalapeno were dry sautéed. Till it smelled like walking past a food truck. Then the beans and sauce ingredients were added and the mixture was covered and left to simmer. Meanwhile over in the refrigerator, the baby carrots had been marinating since the night before. Out came ‘the George,’ and the were lined up on the preheated grill. The lid came down and the timer was set for ten minutes. 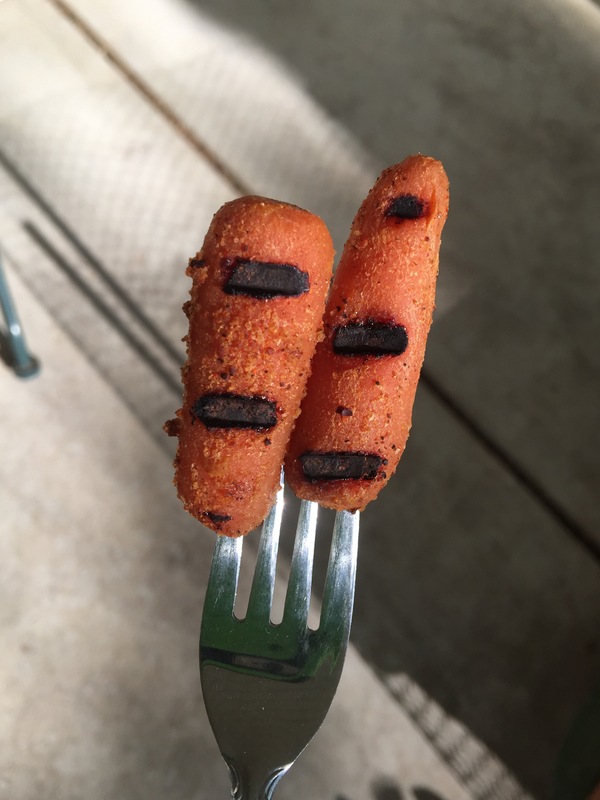 The goal – cute little grill marks. Goal achieved. The cute little Ca’Weenies were added to the beanies. 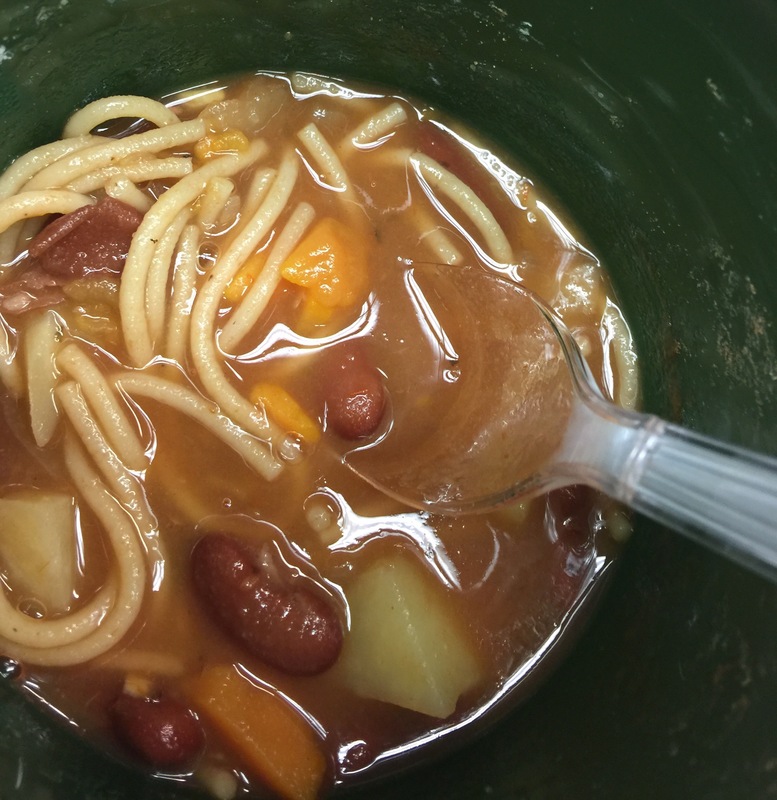 “Very tasty,” I said the next day when I had leftover Beanie Ca’Weenies in my lunch. “I smell barbecue” said someone in the next cube over. 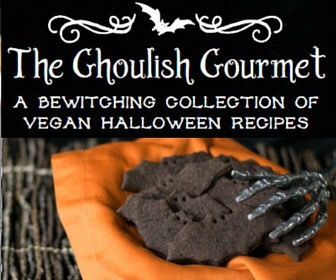 Adapted from two Happy Herbivore recipes, combined as a fun remake of a classic (but not gourmet) dish. Night before – Bring pot of water to a boil. Add carrots and reduce heat to medium. Cook for 10 minutes. Goal is to just barely cook the carrots, not to mush them. Put vinegar, water, soy sauce, garlic powder, and liquid smoke in gallon size ziplock bag. Drain carrots. Rinse in cool water. Add to zip-lock bag that is full of marinade. Place zip-lock bag in a 9×9″ pan and refrigerate overnight or up to 24 hrs. The longer the marinating is, the stronger the vinegar taste becomes. 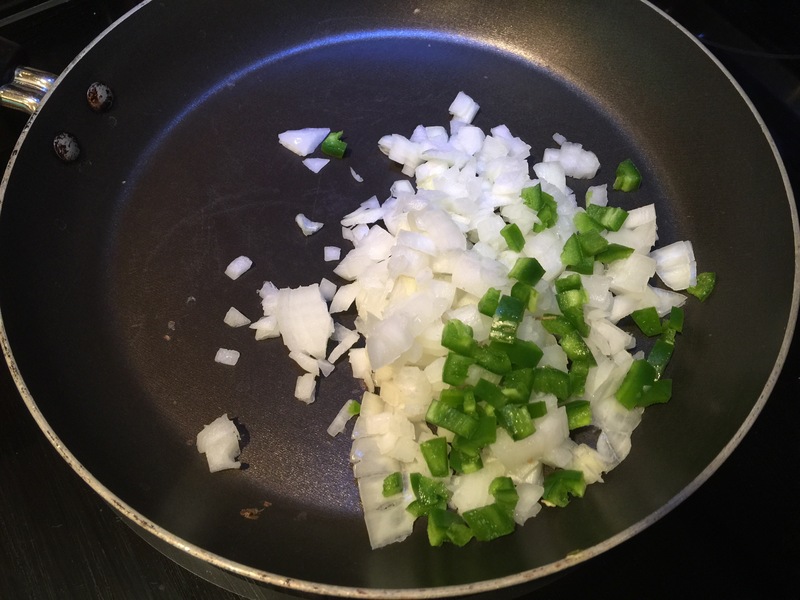 Serving day – Dry sauté onion and jalapeño till onion is translucent and till the mixture smells really good. Add remaining Beanie ingredients and bring to a boil. Reduce heat to low. Cover and allow to simmer for about 20-30 minutes. 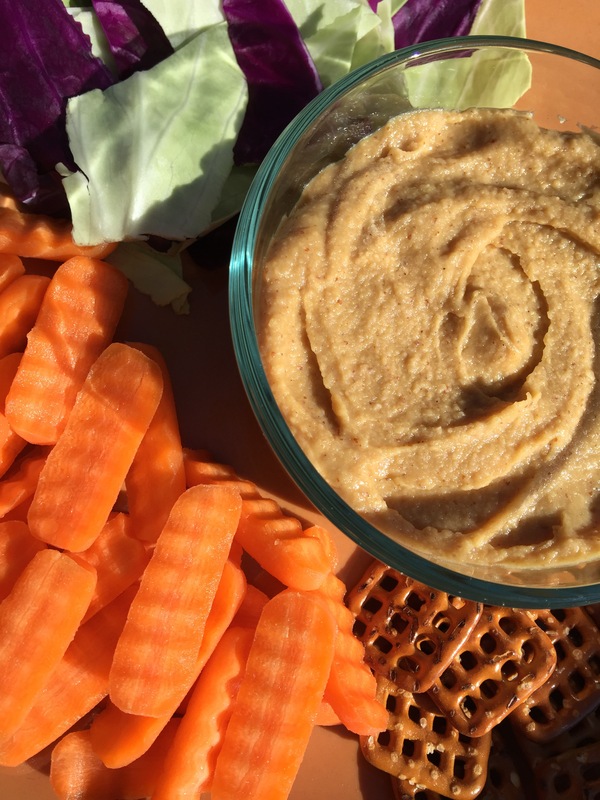 Drain marinaded baby carrots, saving marinade. 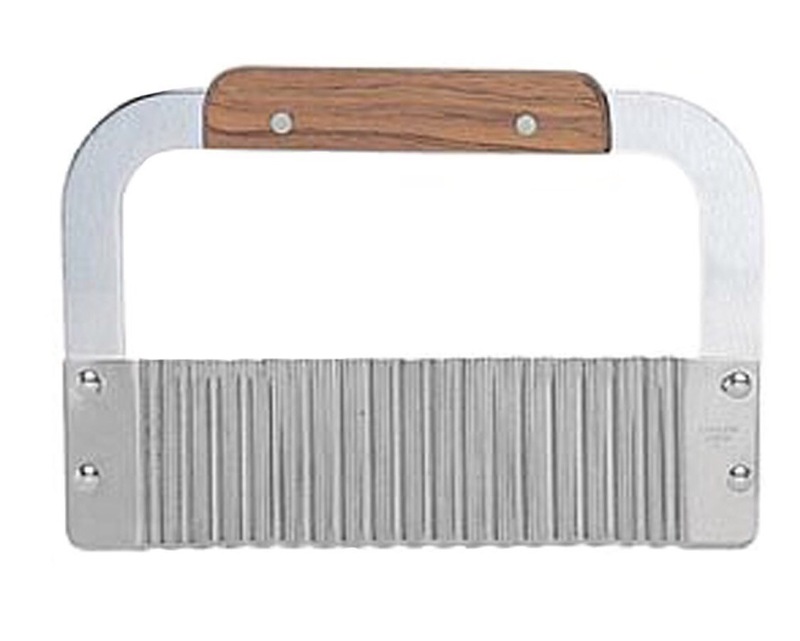 Preheat ‘George Foreman’ type grill for 5 minutes. 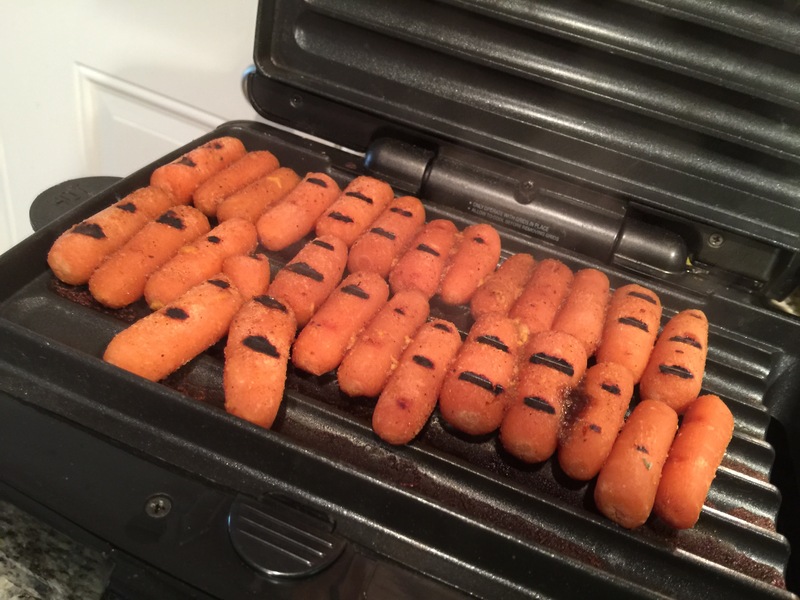 Place drained carrots on hot grill, placing so as to create grill marks. 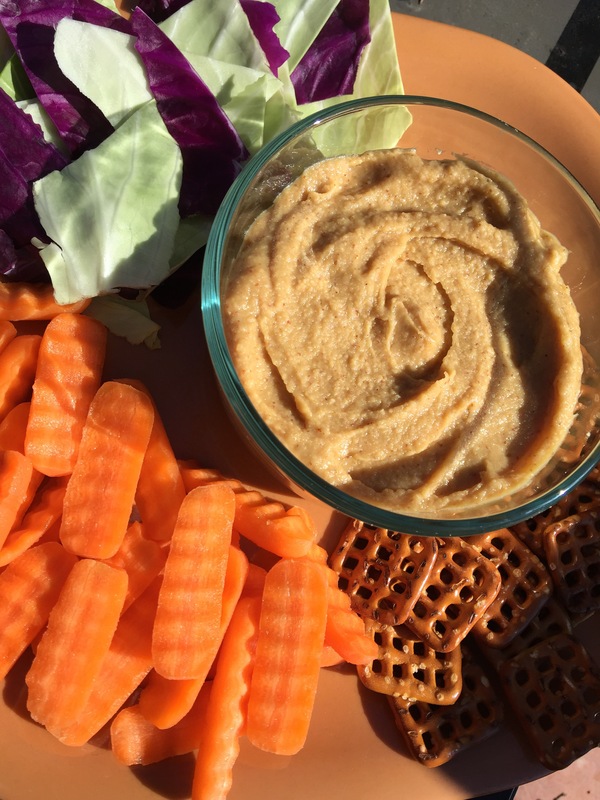 Pour reserved marinade over carrots. Lower the grill’s lid and let cook for about 5 minutes, or till desired grill marks appear. 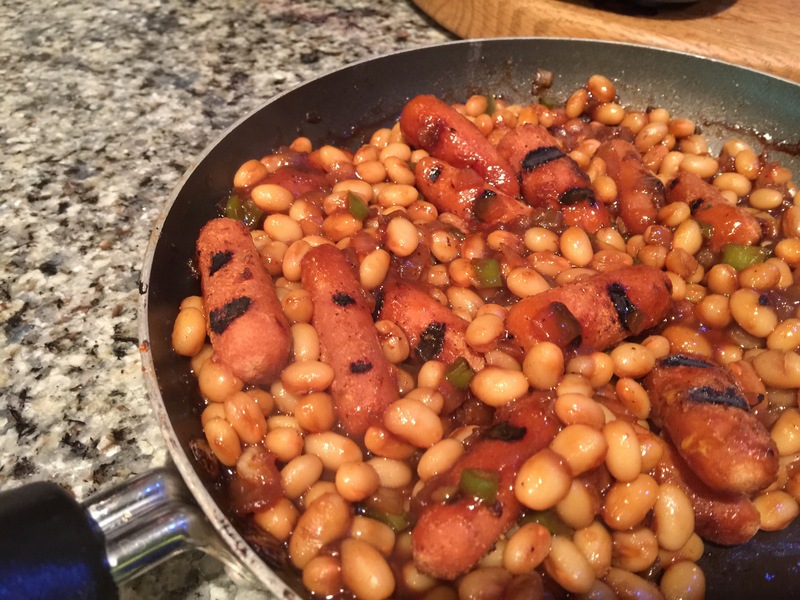 Add Weenies to Beanies. Toss together and serve. Kid Tips – If preparing for young children, may want to eliminate jalapeño and hot sauce, may also want to chop onion very finely.